A soundcheck takes place before a performance to check the venue's sound system and ensure that the sound in the front of the house (for the audience) and rear-facing speakers (the stage monitor sound systems) is clear and at the proper volume and frequencies. During soundcheck, musicians set up their instruments, plug in and play a few songs, working with the ​sound engineer to get the right levels for both the audience and what the musicians are hearing on stage. Soundcheck usually happens about an hour after load in. The headlining act gets to soundcheck first, partly because it's a privilege of being the headliner (when you soundcheck first, you usually have a long break before you have to play) but also for logistical reasons. If the opening band soundchecks last, their gear can remain set up on stage so that they can simply walk out and play without additional set up time. Be prepared: Do your research and know what to expect prior to arriving at the venue. Before the show, send your band’s stage plot to the sound engineer. If the venue if prepared for your arrival, loading in and setting up will be more efficient. A productive soundcheck can be done in well under an hour. Arrive early! If you spend too much time loading in, it can cut into your critical soundcheck time or even eliminate it altogether. Get ready to hit the stage: You know your set, so set up your rig appropriately in advance. This includes the number of guitars needed (don't forget the spares), your amp and FX pedal settings, and preparing the proper cables and power supplies. Dial in your amps' settings beforehand; you can adjust them during soundcheck as needed. Same deal for your pedals--have them set and ready with new batteries. 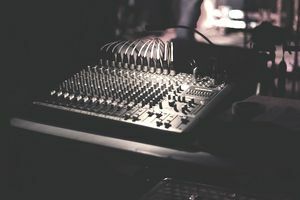 Accept that the sound engineer knows best: This is the time when the engineer can help take your music from sounding good to great--if you let him. The engineer is in the best position to judge and if he asks you to turn down the volume (a common request) or change up your sound, he's got your back. Also, don't forget that the audience absorbs sound and rooms without people can sound boomy and bad. Soundcheck isn't a rehearsal or performance: Soundcheck isn't the time to just plug in, let loose and start killing it on stage. Nor is it the time to toy with new songs you're writing or performing your whole set. This is serious preparation time that sets the stage for the quality of your show. When you're Paul McCartney you can show off your offbeat numbers and later use a few of those on your live album, as he does, but until then, play snippets of at least two songs. Choose your loudest and quietest tracks as they give the engineer more to work with, and play songs that use all your instruments and mics at once.